Photos and words by Tara Leigh. Initially serving as a wartime hospital, Larundel Mental Asylum opened its doors as a mental asylum for psychiatric, schizophrenic, psychotic and geriatric patients in the 1950s. Treating a population of primarily women, the asylum was closed in the late 90s as pharmaceutical treatment became more effective and accessible to patients. Growing up in the area, Larundel was always on my list of places to go. Kids would sneak into the mental asylum at night and I grew up hearing stories about the weird things that they saw, heard and smelled. There were many ghost stories associated with asylum. The most common incident was hearing a faint music box playing on the second floor. As the story goes a little girl who was a patient at the asylum used to play her music box all day, and can still be heard at midnight. I’m not sure whether I really believed the stories I heard as a child but I still was hesitant to visit Larundel at night. After 22 years of anticipation of what it might be like inside and having nightmares about what was awaiting me, I finally built up the courage to visit. Despite the fence surrounding the perimeter and signs forbidding entry, gaining access to the crumbled facility was incredibly easy – simply pass through the giant hole in the fence left unattended. I was overwhelmed with the size of the property. The compound was huge, and there were many different buildings to explore. 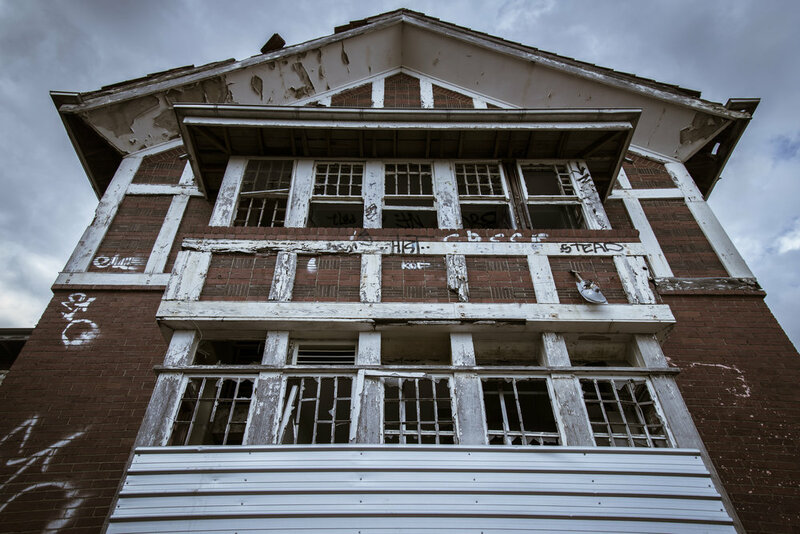 It was once even bigger, as the surrounding residential apartments were once apart of the asylum when it was active. The entire grounds were in decay. Every window broken, holes in the floor and parts of the roof were missing. As well as the psychological anxiety, exploring its empty hallways and abandoned rooms was a tangible danger. Disregarding the millions of scribbled tags on the walls, many artists have used the ghost stories as a muse. 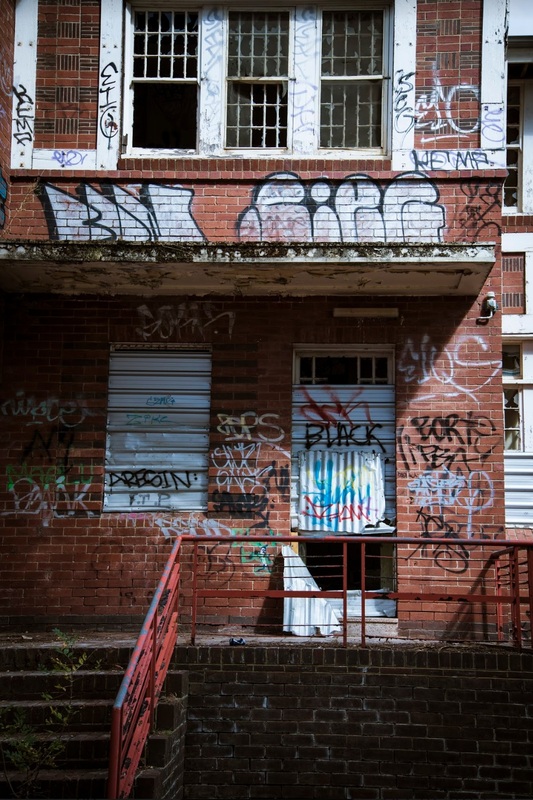 Graffiti and instillations helped to set the eerie mood with phrases such as “Help Me” and “Save Yourselves” etched across the walls in blood red paint, or twisted blinds subtly created contorted faces of your nightmares. Some pieces were so subtle that it wasn’t until I got home and looked at my photos that I got chills. I found that the outside of the building was just as impressive as it looks so similar to what I imagine it would have when the asylum was running in the 1950’s. Throughout my experience at Larundel I was completely on edge and unjustifiably terrified of the creaks in the floorboards and the wind passing along the metal slats along the windows. The buildings that are left standing will inevitably be torn down, and any time I drive past I make sure to check to see if it is still standing. The thrillseeker and photographer in me is very sad to see the building’s slow demise, along with all its history and memories – both as an asylum and the haunted attraction it is today.